Neptune, you might know it as the blue planet. It is also the fourth largest planet in the solar system. And it is a impressive 4.5 billion km away from the sun. It also gets most of it's light because light is reflected of the planet Aldebo. Dark colored rings have been detected around the blue planet, but are much less than those of Saturn. When these rings were discovered, it was thought that they might not be complete, but this was disproved by Voyager 2. 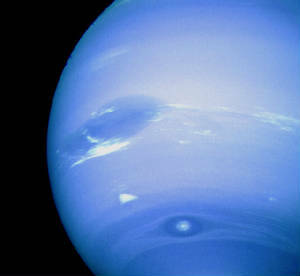 Neptune also has winds of hydrogen, helium, and methane. That gives the planet its blue appearence. It had in its southern hemisphere a Great Dark Spot comparable to Jupiter's Great Red Spot.